One of the hottest trends in decorative concrete floors are metallic coatings that allow you to "gild" your concrete in an array of glistening patinas (see Adding Dazzle with Metallic Coatings). 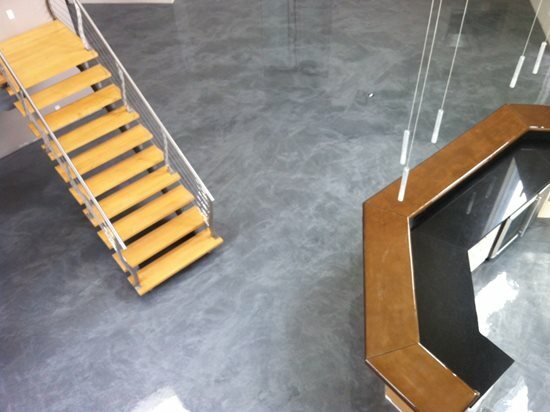 One of the newest metallic epoxy systems on the market, Ultra Surface Metal Fusion from Concrete Solutions, allows contractors to heighten the effects and make floors look three-dimensional. Other attractive properties of the floor coating include a low viscosity, no VOCs (Metal Fusion is solvent-free), low odor, moisture insensitivity, and excellent bonding to properly prepared concrete surfaces. 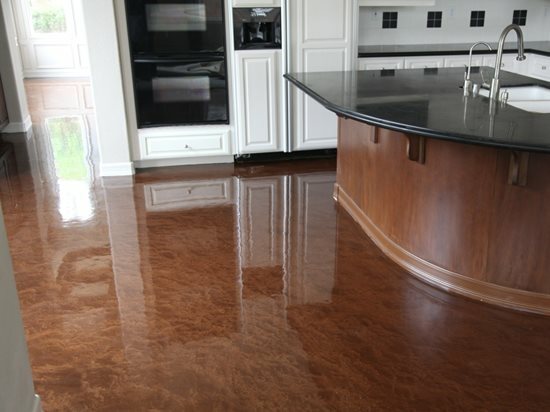 A kitchen floor covered with Metal Fusion in Metal Mocha. Sadleir does not recommend using Metal Fusion on outdoor concrete because the 100%-solids epoxy formulation will discolor after time when exposed to direct sunlight. However, it can be used on high-traffic interior concrete floors because it offers excellent impact and wear resistance. “For better scratch and abrasion resistance, we recommend a topcoat of Concrete Solutions' HP (high-performance) urethane. “This system will provide many years of wear under heavy foot traffic, while maintaining a magnificent finish,” says Sadleir. To eliminate the need to reseal down the road, a floor finish or hard wax can be applied every few months. Training availableConcrete Solutions does not require applicators be certified to purchase or apply Metal Fusion. “For anyone that has applied epoxy or urethane-type coatings, it is straightforward and easy to achieve great results with Metal Fusion,” says Sadleir. However, for contractors without any coating experience, Concrete Solutions offers hand-on training classes every month at a facility in Las Vegas. They also demonstrate the system at supply store deminars.